Marta Dyczkowska works explore themes of identity, memory, and migration. Through performance, video, sculpture, and installation, Marta uses objects as threshholds that link past and present, producing multiple narrative and manifestations. 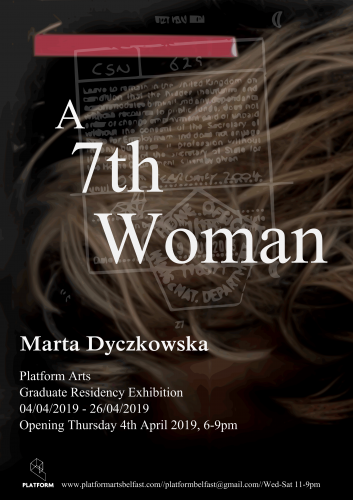 In “A 7th Woman”, Dyczkowsa explores the states of uncertainty and anxiety brought about by recent tumultuous events in British politics. The exhibition serves as an attempt to find a voice, not only for Dyczkowska herself, but for other Eastern European women living in the UK. Marta Dyczkowska (b.1980, Poland) is a multidisciplinary artist based in Belfast, Northern Ireland. She graduated from the Ulster University School of Art & Design in 2018, where she was awarded the Platform Arts Graduate Residency and the Artist Moving Image NI Graduate Award. Her works have been exhibited both nationally and internationally and featured in Circa Arts Magazine. Marta is currently also undertaking a residency at the Ulster University School of Art & Design and holds a studio at Flax Arts Studios.